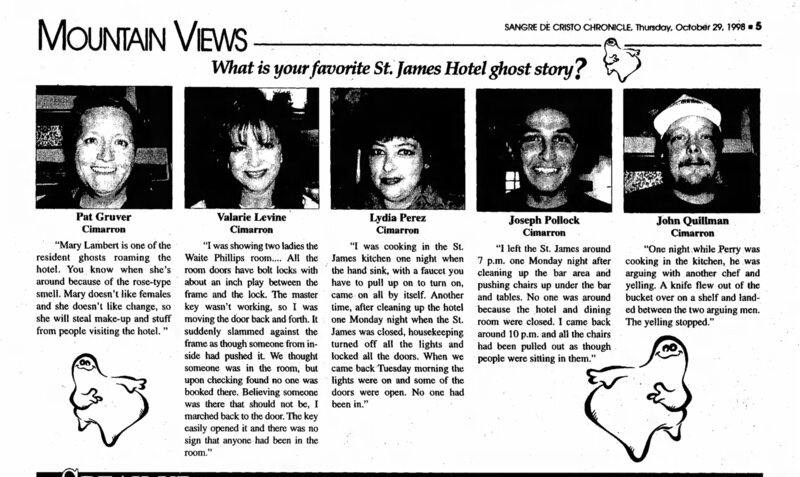 One of the most famous ghost stories in New Mexico is the ghost of Room 18 at the St. James Hotel in Cimarron. According to the story a man named T.J. Wright wins the hotel in a poker game and is shot after he leaves the poker room. He crawls back to his room and dies there. His ghost now haunts the room and doesn't like it when people enter. 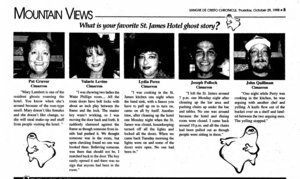 Quite a television shows have featured the St. James hotel and it's ghosts starting with Unsolved Mysteries which aired in 1991. Other television shows include Dead Famous (Biography Channel), Ghost Prophecies (A&E) and Ghost Adventures. Is there really a ghost haunting Room 18? Sometimes ghost stories are just ghost stories. They are not actually "haunted' by the spirits of some tragically lost souls or entity. In fact. the mass majority of "haunted" places are actually nothing more than a good ghost story. Humans are story tellers. When an seemingly unexplainable event occurs, it triggers the story telling ability we have to create stories which can influence the beliefs of others. So how can you know if you are hearing just a story or if the events themselves are real? One way that can provide you with an answer lies in historical research. You want to find the first printed report of what happened, the genesis. If you can isolate the genesis of the stories, you can see if the stories and their components change over time. If they do, it is a indicator that myth building has occurred. So let's go back in time by using the newspaper achieves and see what we can find. Ed and Pat bought the hotel in 1985. 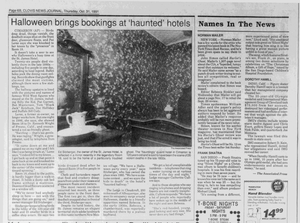 From reading the various newspaper articles, the "attack" in Room 18 occurred sometime in 1986. 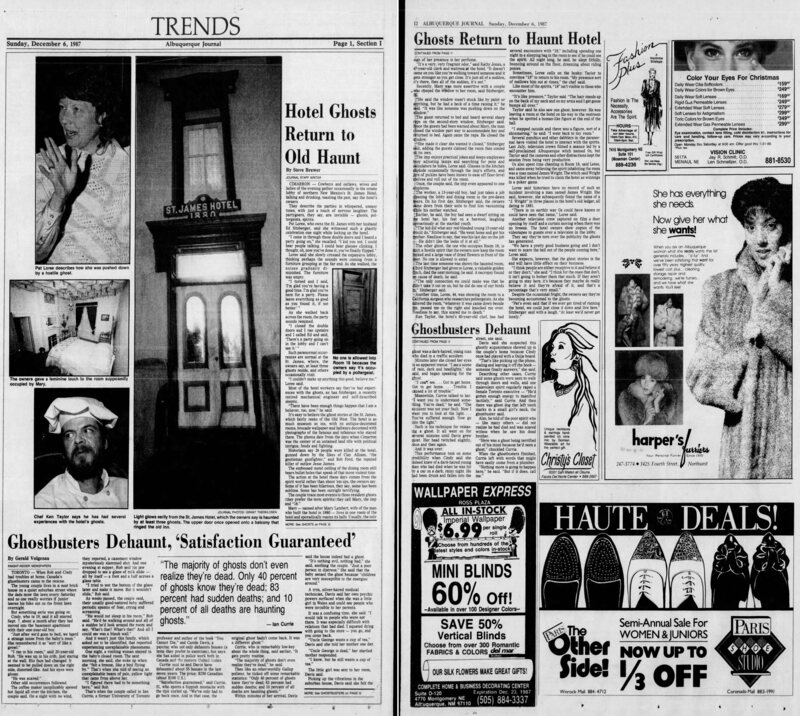 The first newspaper that mentions the building is haunted is also in 1986. 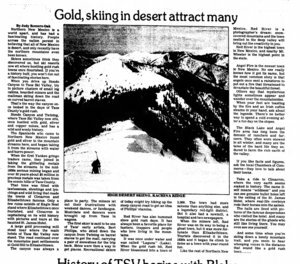 The first detailed story is printed in 1987. Since this appears to be the genesis, there are several important factors to understand from this article. "Several psychics and other dabblers in the paranormal have visited the hotel to interact with the spirits. Last July, television crews filmed a séance led by a self proclaimed Albuquerque witch named Oz, but Taylor said the cameras and other distractions kept the session from being productive. Oz also spent time chanting in Room 18, said Loree, and came away believing the spirit inhabiting the room was a man named James Wright. The witch said Wright was killed when he tried to claim the hotel as winnings in a poker game." "There is no earthly way Oz could have known or could have seen that name." "Mary" is not necessarily the ghost of Mary Lambert, just named after her for convenience. 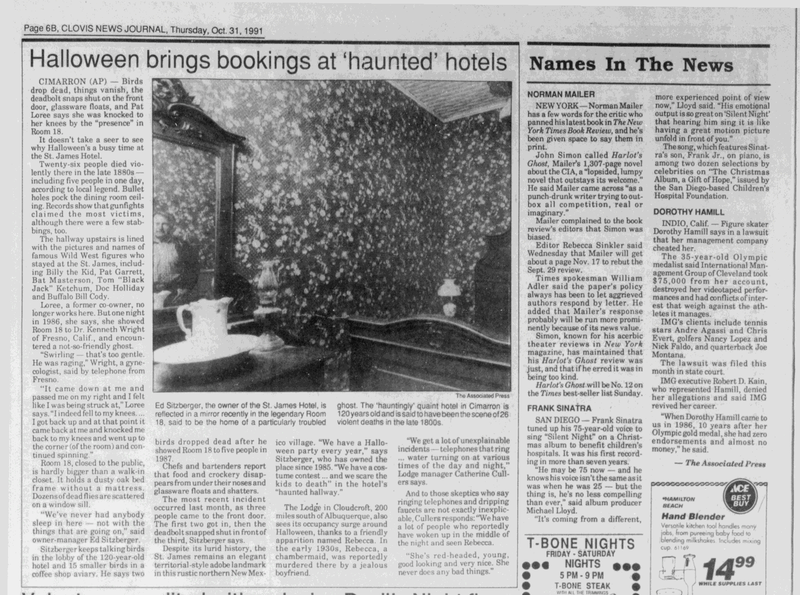 The ghost is room 18 is initially believed to be James Wright, which Loree claims to find in the guest register. With these few things in mind, let's move to the next article that was published a year later in 1988. In this article, which interviews Loree, there are some contradictions between the stories told a year earlier. Here she says that a man from California came to the hotel and talked her into opening Room 18. This would be Dr. Kenneth Wright who was identified by name later in the Unsolved Mysteries episode on the hotel. Does it seem odd that the last name of the ghost hunter is the same as the ghost? Could Loree have pulled that name from her memory? What about the first name of the ghost that supposedly haunts Room 18? In this article she says that it was a James or Jesse Wright. Those names would fit well with an old west hotel whose rooms are named after famous people from that era. (Jesse James, the outlaw?) While this may seem like I'm nitpicking it is very important. What's at stake here is the creditability of the witness and elements of her story are changing.
" there was a presence whirling in the corner of the room near the ceiling and it came down and knocked me to my knees. I got up and it came back and knocked me down again. She says that the man from California told her to step backwards and she escaped from the room. He sent her downstairs and he stayed in the room for another hour." Loree said he told her later that the spirit in there should not be challenged and that it did not like being talked about. There is a big difference between sensing a presence (something unseen) and a "glowing ball of energy" that is seen by both people. The "glowing ball" is the descriptor in the future telling of the story. Another major deviation from the myth also appears here. In this article, Loree, a self proclaimed "witch" states that she went back into Room 18 and learned that the spirit was named James or Jesse Wright. She then looked through the guest registers and found T. J. 's name. This is a contradiction to the article written a year earlier where a witch named OZ "discovered" this information. Perhaps Loree passed some information onto Oz? Why was Oz deleted from the story? How much creditability would you put in the testimony of a which named OZ? The next significant story appears a year after this article. A year later the psychic enters the picture (Jacque Littlejohn Cooley) along with Ed Sitzberger. The psychic is actually very well informed about the hotel's activity before she even gets there making bias an issue. "Cooley had read the stories about the poltergeists that dwell in the two-story adobe building, including the menacing spirit in Room 18. 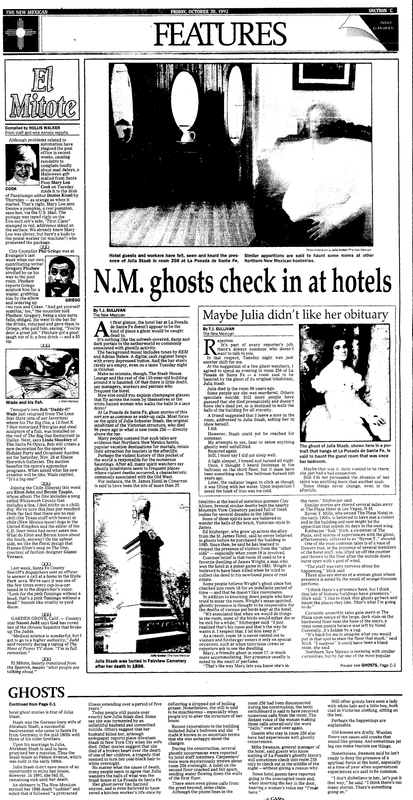 She also knew that a self professed witch had visited the hotel and claimed to have made contact with the spirit, identifying it as the ghost of someone named James or Jesse Wright." The interesting thing here is that Cooley does not agree with the witch about some the circumstances in which surrounding the spirit of Room 18. Apparently she will change her mind about that when TV cameras are present and shooting an episode of "Unsolved Mysteries" for network television. In that show, Cooley claims to be the psychic that discovers the name of T.J. Wright which is then found in the hotel's register. Also in this article, Ed confirms that Loree was the one to locate the names in the guest register but doesn't mention the witch called Oz by name. Apparently, he did not think Oz was very creditable either. "The next day my former wife Pat (Loree) went back into the hotel registers and found the name T.J. Wright three different times in 1881." Again this raises the question as to who actually learned the name of the ghost. It still appears to be Pat Loree who is the same person who "finds" it in the guest register. The creditability of the first witness is starting to wane. 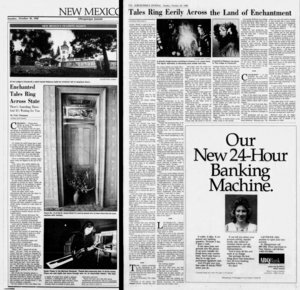 The Clovis News Journal publishes the next article of interest in 1991. This article is the first that identifies Dr. Kenneth Wright as the person Loree was with during the "attack". It also identifies him as being a gynecologist. The episode of Unsolved Mysteries that features the hotel is aired. The people in the show are Ed and Pat Loree, Dr. Wright and Cooley. Once again, another year passes before the next article. "In addition to knocking people down that try to enter the room, Wright's mean spirited ghostly presence is thought to be responsible for the deaths of various pet birds kept at the hotel." A little myth building has entered the picture. Thus far only Pat Loree was "knocked to the floor" but the article seems to imply that it has happened to multiple people. This is typical of myth building. However the genesis of the "haunting" is mentioned, the deaths of various pet birds. The story of Room 18 begins when Ed Sitzberger lets two people inside Room 18 to have a look and several of his pet birds die the following day. The seed of suggestion (that it is haunted) is planted. Afterwards his wife Pat has her encounter in the room. There are a few articles written over the next four years but they are repeating the same information. The hotel and its' ghost stories are about to undergo changes as the hotel changes owners . The next interesting article is published in 1996. The hotel has a new owner, Perry Champion. The shot of whiskey ritual is started. "Champion said he made the mistake of trying to vacuum the room. The machine sucked up a nail, which broke the impeller. When that was fixed, the electricity kept going off until he gave up cleaning, poured a glass of good whiskey, set it in the room and left, locking the door behind him. Two days later he checked and the whiskey was gone". "Wright had also been a lover of Lambert's wife, Mary." So is the "ghost" is room 18 really the spirit of a man named T. J. Wright? The basis of the whole story depends on it. However, the simple fact is that the back story is wrong. Yes, a man named T.J. Wright stayed several times at the St. James Hotel. However, he did not die there. 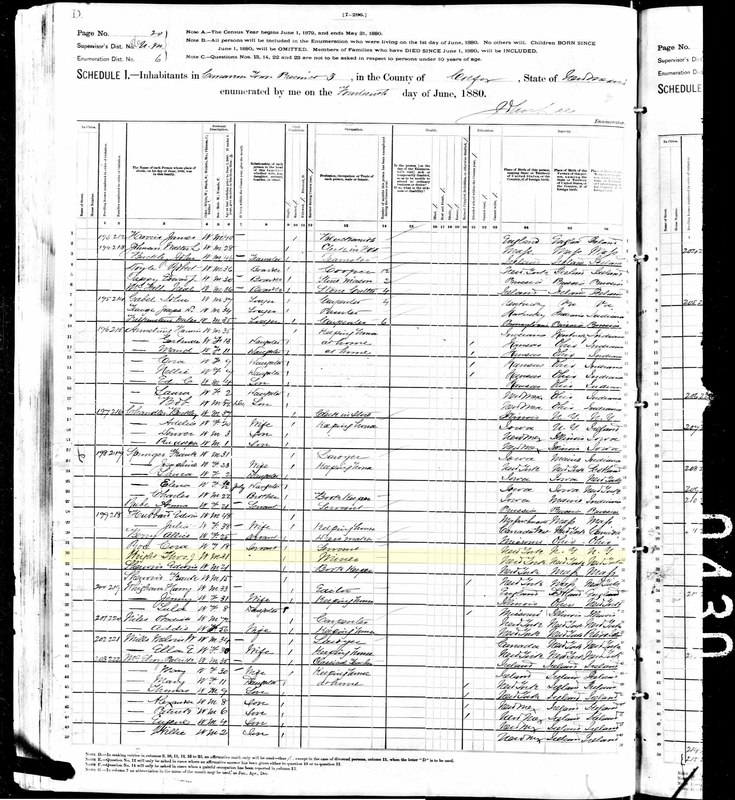 The 1880 Federal Census does indeed show that T.J. Wright was living in Cimarron. His occupation is listed as a miner and it appears that he is residing at a boarding house or a rented room in a private home. According to the legends he dies at the St. James Hotel in 1881. After searching the State achieves in Santa Fe, we were unable to locate a death certificate for a T. J. Wright. 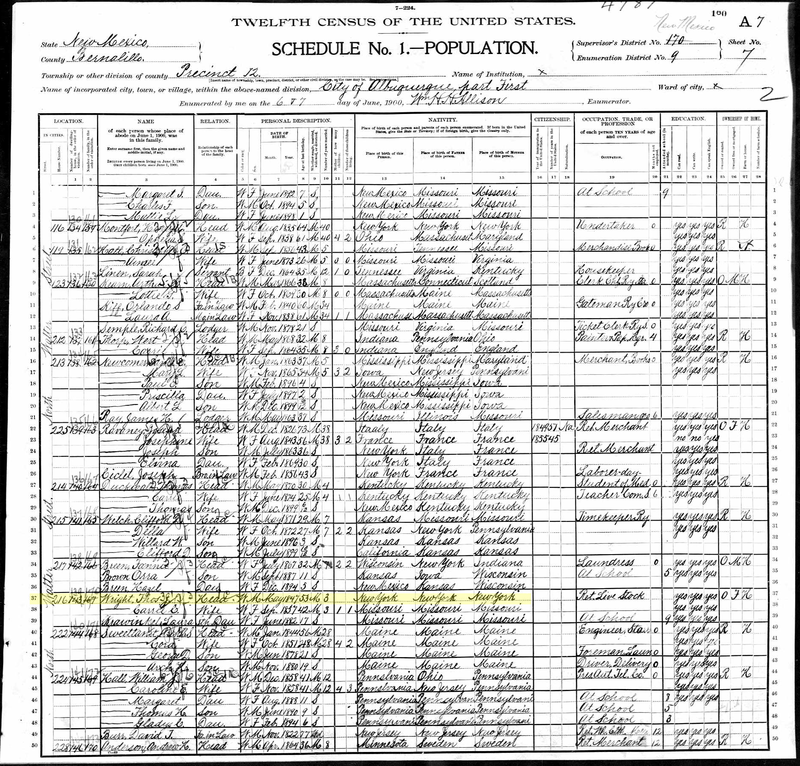 However the 1900 Census shows that T.J. Wright has moved to Albuquerque, has changed professions and is now married. Therefore he could not have died at the St. James in 1881 and the myths concerning his death are very inaccurate. Another historical inaccuracy is the location of a poker room on the second floor. Early blueprints of the hotel show that this was simply another room for rent and was equipment in a similar fashion as all of the others. There have been multiple renovations at the hotel over the years. 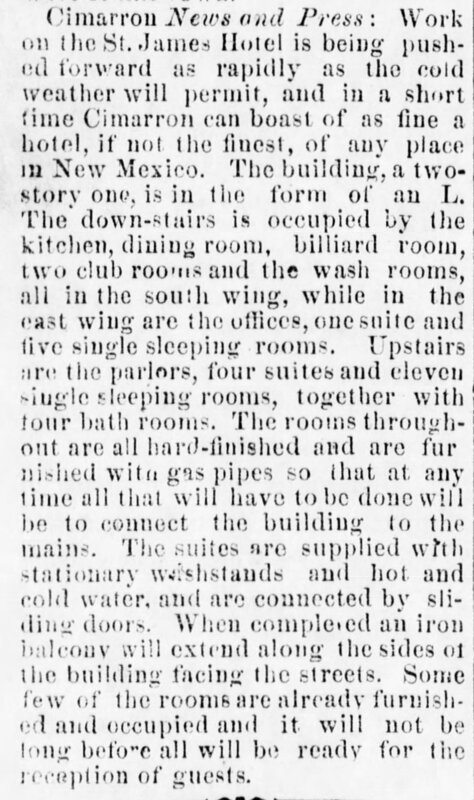 An accurate description of the hotel in 1880 can be found in the newspaper achieves. The area where the "poker room" is was actually one of the single sleeping rooms. The suggestion that Lambert would have allowed a card game on the second floor is not very plausible either. At that time, hotels kept a close watch on gambling and often tolerated them due to the financial gain of selling the players alcohol, cigars and food. Also, like hotels today, the owners would not have put such a noisy activity on the second floor where it would have disturbed the other paying guests. That would have been bad for business and the success of the hotel indicates that this was not done. A video shot in 2006, which SGHA was involved with, is also interested. Forward the video below to 9:45 where one of the former owners admits that it is a great marketing ploy. "Room 18 is also off limits to most people, because it is associated with the mysterious deaths of several hotel patrons, most of them attributed to the ghost of Thomas Wright. Furthermore, due to the dangerous nature of the room, employees of the hotel advice all of their guests to avoid that area while traveling through the floor. Likewise, most requests for visiting Room 18 are denied due to its troubling reputation." Deaths from entering room 18? This is complete nonsense that started with a TV show called "Ghost Prophecies" that aired on the A&E Channel on November 28th, 2010. This new "angle" was taken to make that show different and more scary than the other TV shows that have featured the hotel. Fortunately it is not true as everyone on our team, several local TV celebrities and D.J. 's from 94 Rock would be dead. Room 18 is actually quite easy to get into if you are willing to pay for it or if you have media with you. The history presented in the newspaper articles clearly shows that the press was allowed into the room on multiple occasions, starting in 1987. This is a result of myth building. 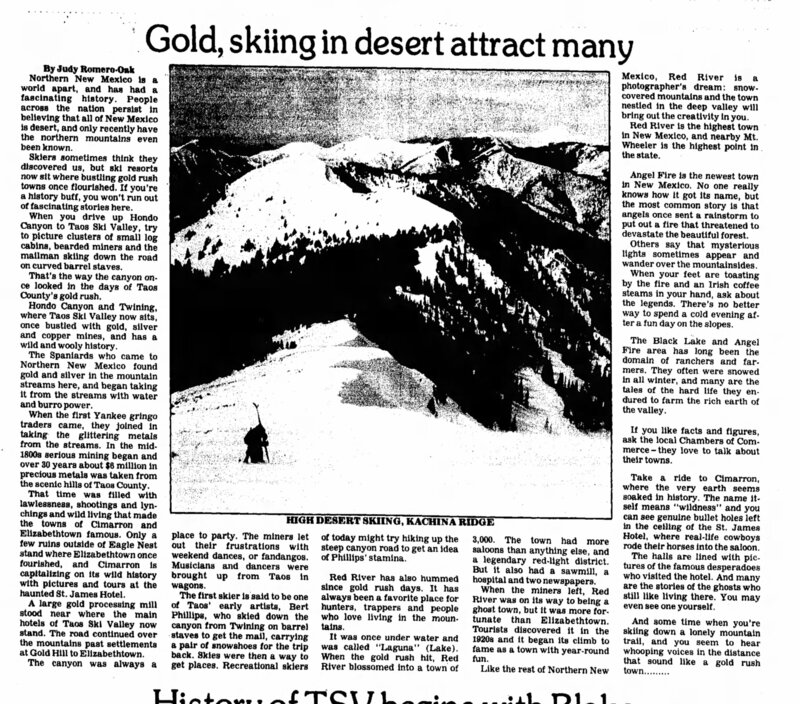 The original story can be found in the 1987 article from the Albuquerque Journal. The employee, a 15 year old boy, claimed that he saw a dwarf sitting on the hotel's bar with his feet on a barstool laughing uproariously. He ran and got his mother. The face of the "ghost" of the dwarf or little boy is not scarred or burned. It does not jump down and vanish into the floor. These elements of the story are added when the TV show "Unsolved Mysteries" recreates the story with a few embellishments to make it a little more scary. Eve in the TV show, the "dwarf" is not linked to Johnnie Lambert. If fact, this story became overshadowed by the more infamous T.J. Wright. During one of our visits in 1991 several employees told us that they believed the story was nothing but a hoax. They claimed that the 15 year old employee was lazy and didn't want to work at the hotel. So he created the ghost story to get out of having to work. The "dwarf" was never seen again. When the hotel reopened after being remodeled in 2010, the story was revived thanks to the input of a multitude of "paranormal investigators" and was soon being retold again with the new twist. While it is not possible to say that the St. James Hotel is "haunted" or "not haunted" it can be determined that the ghost of room 18 is either misidentified or was simply fabricated due to a number of possible explanations. Based on the conflicting accounts and changing stories, we tend to believe the later.